The Western Wood Products Associations says in its Grading rules: " ... it is one of the most sought after products from the clear portion of the log. It is widely used for high quality interior trim and cabinet work with natural, stain or enamel finishes." cv - Clear Vertical Grain - Pieces may exhibit a few minor characteristics which do not detract from their high appearance and quality. Limiting provisions include: very light torn grain, very light skips on the non-graded face and very light warp. 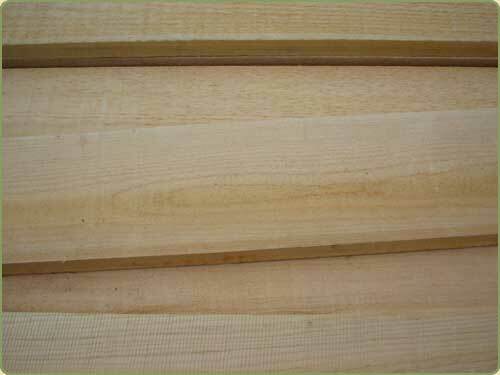 c - C & Better Clear - Pieces of this grade are of sound wood.Ý Most pieces are entirely clear or have only a few unimportant characteristics such as: medium stained sap wood , short splits in not more than 5% of pieces , small pitch streak or a smalPieces of this grade are of sound wood. d - D and Better Clear - This grade accounts for pieces of lumber having one or more characteristics which are of such size and number that the piece is not of C & BTR grade. Medium pitch streaks, limited pin holes, hit and miss skips, two knots approximately 1" or their equivalent. tk - Select Tight Knot - The basis for this grade are the knots, burls and naturally occurring markings which are of fairly uniform distribution and add to the decorative character of the piece. Sound, tight knots: star checked and/or slightly chipped knots permitted. bt - Standard and better - The visual quality takes precedence over the structural integrity of a particular piece of lumber. grain density, coloration and clarity of the exposed face is key to selection. Note the different colors above (some boards have been finished). Port Orford Cedar, like any other wood, has a range of colors. On special orders we are able to match colors at an extra cost.